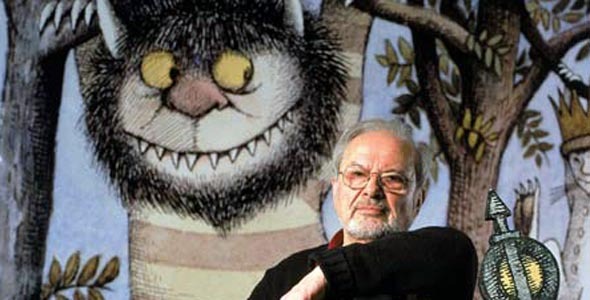 It's a sad day for the world of children's literature as Maurice Sendak passes into the next life today. The writer and illustrator of books such as In The Night Kitchen and Outside Over There died following complications arising from a stroke on the morning of May 8th, 2012. His first book in thirty years, Bumble-Ardy, was published in September 2011 and spent five weeks on the New York Times Bestsellers List for children's books. Sendak's final book - My Brother's Book, inspired by his late brother Jack - will be published posthumously in February 2013. The self-taught illustrator, who is sure to be greatly missed by generations of children, is best known for the now-classic Where The Wild Things Are. A full obituary can be read in today's New York Times. 2012 has so far been a good year for literary movies: with David Nicholls' hit novel One Day also proving to be a blockbuster at the box office, and Susan Hill's spooky The Woman in Black (with Daniel Radcliffe adorning posters for the film), it seems there's no end to the cinematic treats available to book lovers this year. But believe it or not there is more: Yann Martel's The Life of Pi is out in December, featuring CGI animals, Diary of a Wimpy Kid: Dog Days is released in August, and The Great Gatsby's remake is also to be premiered at Christmas time, starring Leonardo diCaprio (I cannot WAIT). There are also whispers of a film adaptation of George Orwell's 1984. The less said about the poor adaptation of Salmon Fishing in the Yemen, the better. Finalists have also been announced for the FT's annual Foreign Fiction Prize, but this is due to be announced sooner, on May 14, and is worth more in the way of cold hard cash (£10,000). With luminaries such as Umberto Eco competing, against relative unknowns such as Yan Lianke, the competition is certainly hot to trot there too. Wishing the best of luck to all! I admit I am a little addicted to cookbooks. I read blogs like Pip Cooks The Books with near-religious fervour and my Amazon wishlist currently has 25 cookbooks on it (read: far more than I actually have space for). 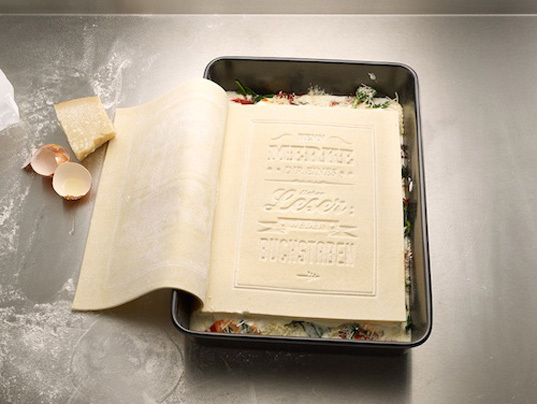 But this one really takes the biscuit (sorry, I'll stop with the food-related puns now): it's an edible cookbook made of pasta, made by German design agency Korefe, that you can either actually use as a cookbook (recipes are printed on it) or that you can eat (the 'pages' are actually tear-off lasagne sheets). Think I would be genuinely torn as to what to do with one! While there are many brilliant ideas from Britain that haven't quite reached France yet (such as shift working and cashback), here's an idea that perhaps the Brits should consider stealing from their Gallic brothers: the notion of a tax on bookshop chains to help promote smaller independent stores. This has been suggested by Frédéric Mitterand, France's Minister for Culture, as part of a review of the French publishing industry. Such a tax would apply to online retailers, such as Amazon, as well as to physical shops, such as the FNAC. Mitterand's recommendations also include the monitoring of book prices in book chain stores (another major chain in France is France Loisirs). Even if these are ideas put out at an election time in order to stir interest or comment rather than being close to impending implementation, I still think they're worth considering: our small bookshops are to be treasured in the face of big business (says she, who is a complete Amazon whore), but at the same time work needs to be done on consumer attitudes in encouraging them to support their local community and retailers. Sadly, where I live, we don't have a local independent bookshop. Perhaps an idea for a career change if one day stepping into a classroom full of hormonal teenagers doesn't appeal anymore...! The French government also has plans afoot to digitise 20th-century books that are now out of print. These will be sold online, with the French government collecting 40% of the royalties, while publishers get the rest. The plan is operating on an 'opt-out' system, meaning that authors will be included automatically unless they specifically ask not to be. However, 900 authors object, claiming this infringes upon their intellectual property rights, and it's also worth noting that only works deemed 'indispensable' will be included, meaning that fans of trashier literature may have to wait longer to get their mitts on out-of-print works. The Boston Globe newspaper has recently noted the rising trend of small bookshops springing up within libraries. This can help to counteract the closure of smaller bookstores in a town, enables people to buy books at lower prices, and allows libraries to raise funds for other projects, including the purchase of iPads and Kindles for rental by the library and the screening of films and hosting of lectures for its members. The American Library in Paris also does this, hosting a used book sale monthly - proving that this is an idea that's already beginning to cross the Atlantic.